A few weeks ago I was made aware of the Judges Guild Journal. 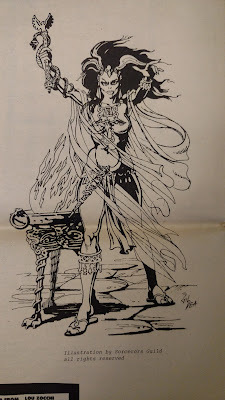 A newsprint 'zine made by JG back in the 70s "dedicated to Swords and Sorcery fantasy gaming". In particular, I was made aware of issue 7 (p) and their witch class. Issue 7 was published in December 1977. 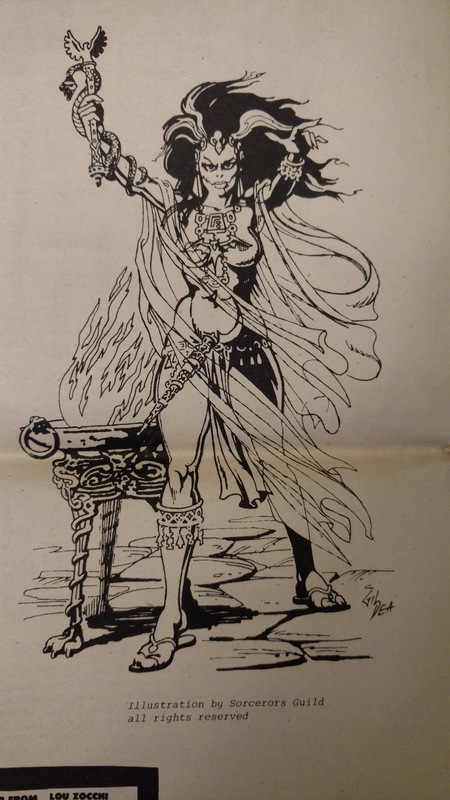 For some perspective, the first Dragon Magazine witch was published in March 1977, though they claim to have received the manuscript for it 15 months prior. 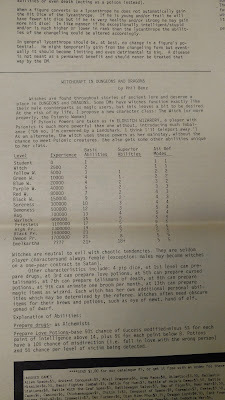 OD&D Supplement III, Eldritch Wizardry was published in 1976. I mention Eldritch Wizardry because the Judges Guild witch, like my own, was very much inspired by it. The article is on one broadsheet or about two typed pages. 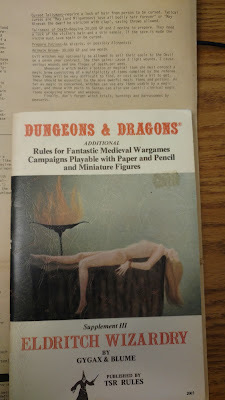 Titled "Witchcraft in Dungeons and Dragons" and Phil Benz as it's byline. I have to give this article a lot of credit. It really went outside the box with this class. Seventeen levels are presented with roughly the same XP values as the Magic-User and has a d4 for hit point determination. The 17th level is something called "Emelkartha". I can only guess this has to do with the Demon Goddess from Gardner Fox's short stories about Niall of the Far Travels. Which curiously enough appear for the first time in Dragon #5. Should we call Shenanigans? What makes this witch different is that she gains psionic powers instead of spells. Her progression is very much like that found in later 2nd edition supplements on Psioincs and similar to the Basic Psionics book released by +Richard LeBlanc. Indeed the author claims right away that a better name for the class is "Psionic Woman". He also makes a good point about the Magic-User being unsatisfactory for a witch class. The class then goes off into non-psionic and more spell-like areas, with the creation of potions and drugs. I am also pleased to see the inclusion of talismans, something I also added to my witch class. 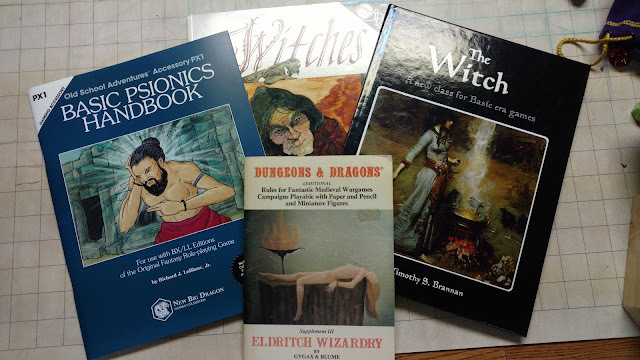 There are a lot of witchcraft trapping with this class, but I am not sure how well they mix with the D&D Psionics. It certainly looks like a fun playable class. There is a bit here about how males can only become witches under a special contract from Satan! This article is much smaller than the one found in The Dragon issue #5, but is some ways is a lot more interesting. I think that the Judges Guild article has the benefit of reading the Dragon magazine one first. While I have no proof that the Dragon magazine article influenced this one I do find it difficult to believe that someone writing for a 'zine at this time had not read Dragon. Plus the inclusion of Emelkartha, which had only shown up in this one spot prior to this, is kind of a give-away. 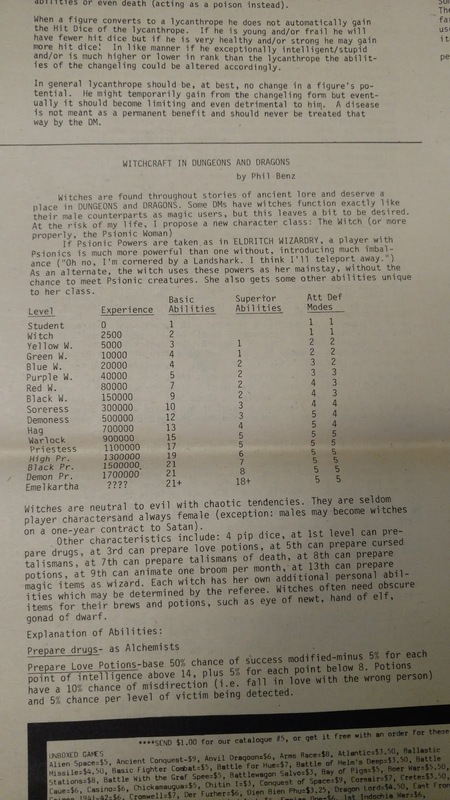 While this might be the first Psychic Witch class published it is not the first one I have seen. The first one I remember reading was the one from the Mayfair Role-Aids book Witches. That witch was a "Deyrini" witch and while I was familiar with the stories I thought it was an odd inclusion. First, the powers were less psychic and still more spell-like. Also, I never got a witch or a psychic feel from that particular class. I later made my own "Natural Witch" that was also a Psychic Witch, but again, something about it never quite jelled with me. This is one of the reasons you don't see a psychic witch in my books now. I could never get it to work right for me. The closest thing I have been able to get to a psychic witch I really like are my Sisters of the Aquarian Order. 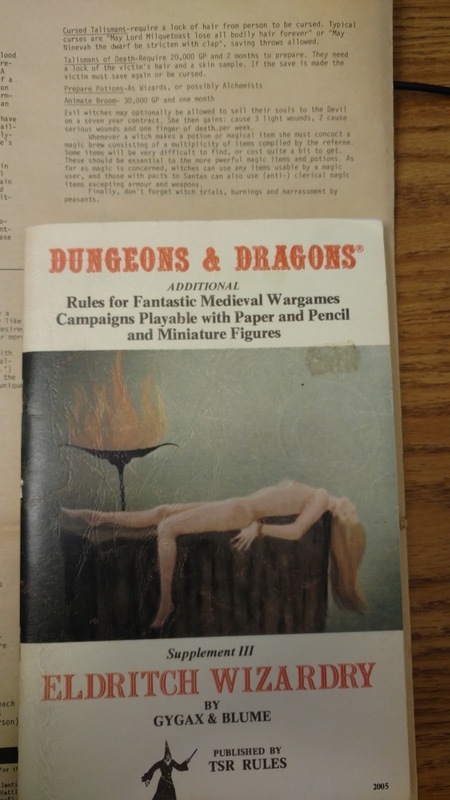 I think the issue is that like D&D, I grew up in the 70s and 80s. The 70s saw the Occult Revival and the 80s saw the Satanic Panic. This has forever locked witches, occultism, and psychic abilities together in my mind. 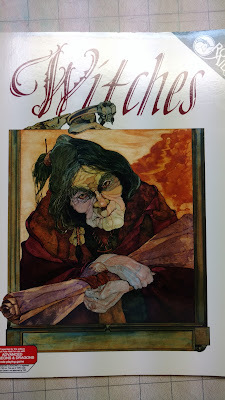 If you read anything published in the 70s about witches they often talk about enhancing their psychic powers. I could see a witch, instead of mixing potions or collecting herbs, empowering crystals or infusing talismans' with her own psychic power. Maybe her familiar is not a spirit but a psychic construct of her own "Shadow Self" from Jung. Her Patron then is a manifestation of her Mana or Higher Self as part of the Collective Unconsciousness (again, Jung). So the Jungian archetypes of Self-Anima-Mana could map on to Maiden-Mother-Crone representations. Jung is, and always has been, a huge influence on how I detail the witch archetype for myself. I spent a lot of time in the 80s reading Jung and it is one of the reasons I worked on a Ph.D. in psychology. Maybe there is something here after all. Maybe it just takes 40 years to get it right! I'll have to think about this much more. 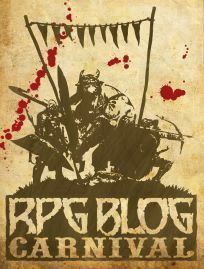 I am also presenting this as another addition to the RPG Blog Carnival on Occult Mysteries and Magic. Also Escape to Witch Mountain was released by Disney in 1975 about psychic kids on the run, so there was a more New Age idea circulating that historical records of witchcraft were actually manifestations of psychic powers. I am really digging the idea of psychic witches. It has a very 70's feel to it. I had forgotten about Escape to Witch Mountain until Jed mentioned it, but yeah, that imprinted on me at a young age about witches being psychic that I have forgotten about. Check out the 1971 book "What Witches Do", which you can pull it up in Google Books. The author Stuart Farrar describes his own wiccan coven's practices in very 1970s new age terms- like the coven acts as a "Psychic Amplifier" or how psychedelic drugs can awaken latent psychic powers, and thus a coven is the best place to learn how to control them.